I love Despair Inc‘s Demotivators – A series of posters that subvert the motivational designs on the walls of offices everywhere. They do a sharp job of pointing out the gap between the lofty aspirations in the posters and the reality of daily working lives. Thanks to US organiser and talented Flickr-ite APDonovan for the use of the original pic. There are some really great photos on LabourStart’s Flickr group, so I thought this idea might have legs. Can you do better? 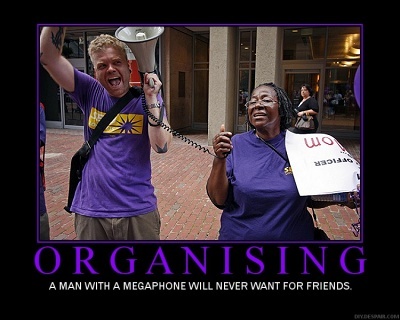 Union-related Demotivators using this online tool, and either this group or your own pics. To kick a union-meme off (and prove the point of Paul’s own choice), Derek, John and Donnacha can consider themselves tagged – but please anyone have a crack at it, and let us know where to find yours. love the RMT specs! I’ve been seeing them around on demos or meetups more often, and the remind me of the ‘X-ray specs’ we had as kids. Maybe they’re designed to see straight through employers’ negotiating positions?